Above Left: R&R with beer and hamburgers. No names. Right: Some of the Radio gang. Top L to R: Camenares, Blankenship, Hancock, Doonon. Kneeling L to R: Thomas, John Shaw, Treblecock. 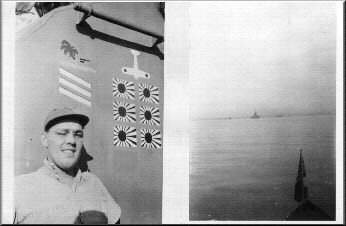 Left: Ships record near end of war, Clarence Duff. Right: USS Missouri taken the day of the signing of the surrender by the Japanese. 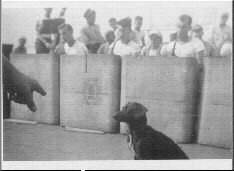 Above: Ship's mascot "Ladybug", missing after typhoon after the end of the war. Above: Left: right front, Esposito. Center: Camenares copying "fox". Right: L to R, Sheehan, Blankenship.